When this issue was first being promoted, there was a lot of theories involving the man between the two teams. This issue is the first appearance of both Triage and Tempus, but before they got those X-Men names. 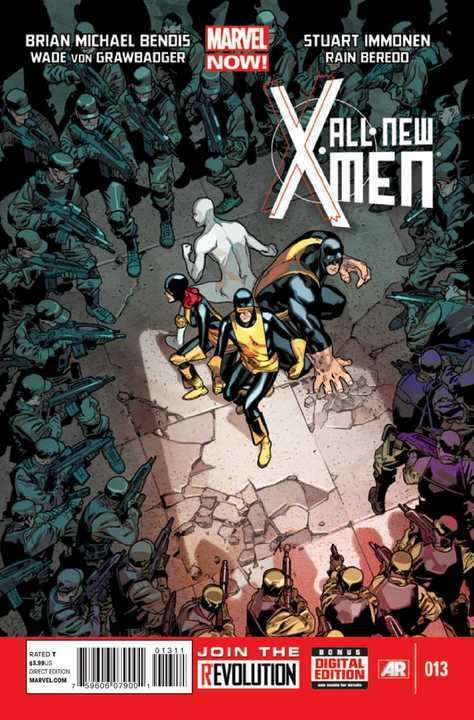 This was also Bendis’ first issue of his still current X-Men run. What a way to start! 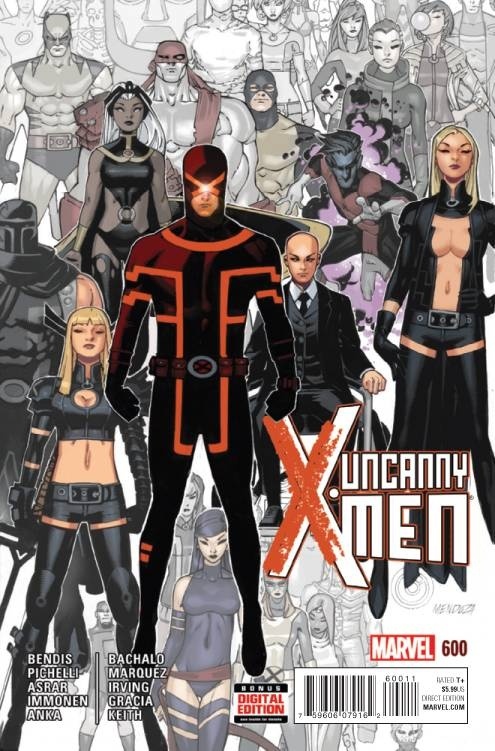 Uncanny X-Men Volume Two ended, so his start to its third volume hadn’t started yet so Cyclops’ side haven’t donned their revolution outfits yet. Feels like forever since they’ve been in their current outfits. Two years, but hundreds of appearances by now. Well, close to a hundred. 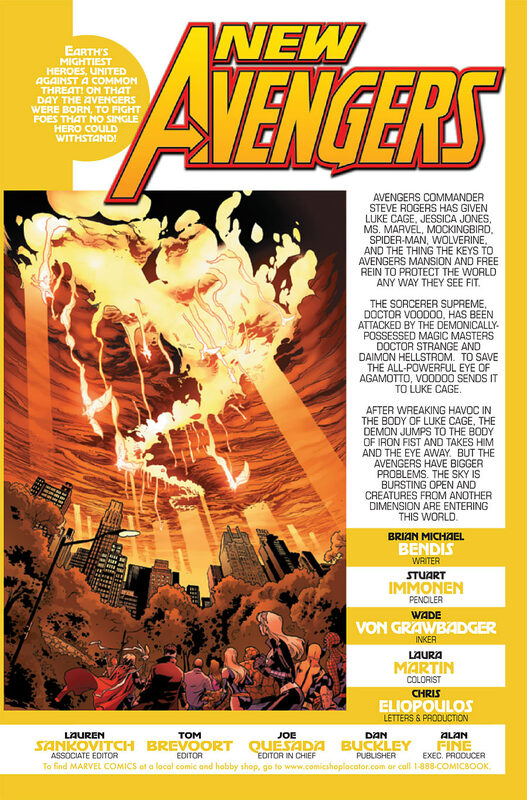 This takes place right after AvX : Consequences. Issue opens with Cat Beast crashing to the ground. He is narrating that he is dying. Gold Coast. Australia. Eva, later Tempus (not this issue), is out on the town with her lady friend. They are there so Eva can finally flirt with David – a guy she has been crushing on for a while. Apparently, he has only seen her in a tracksuit up to this point. Eva’s brother, Steven, shows up and punches David. His five friends start beating up Steven. 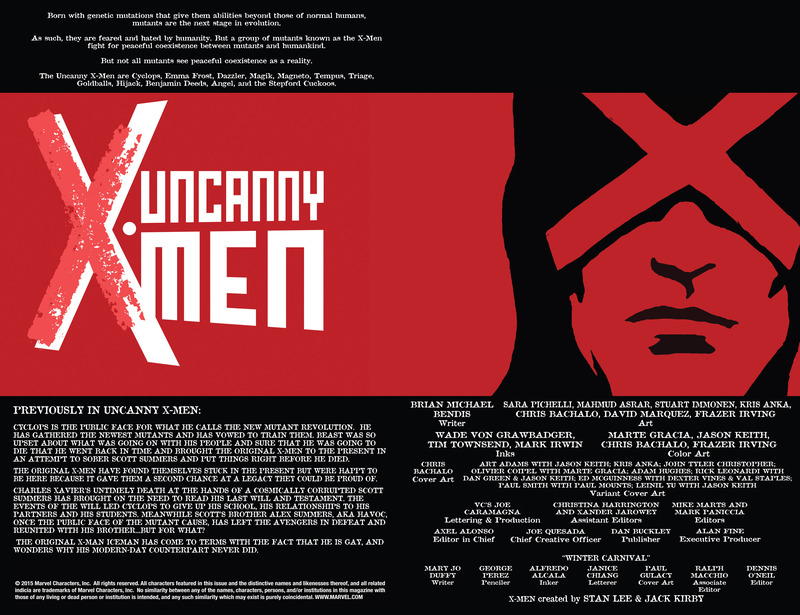 We have not learn more about this past life of Eva’s in the next 27 issues of All New or 21 issues of Uncanny X-Men. Like all good mutant soldiers, they have to completely abandon their previous life. 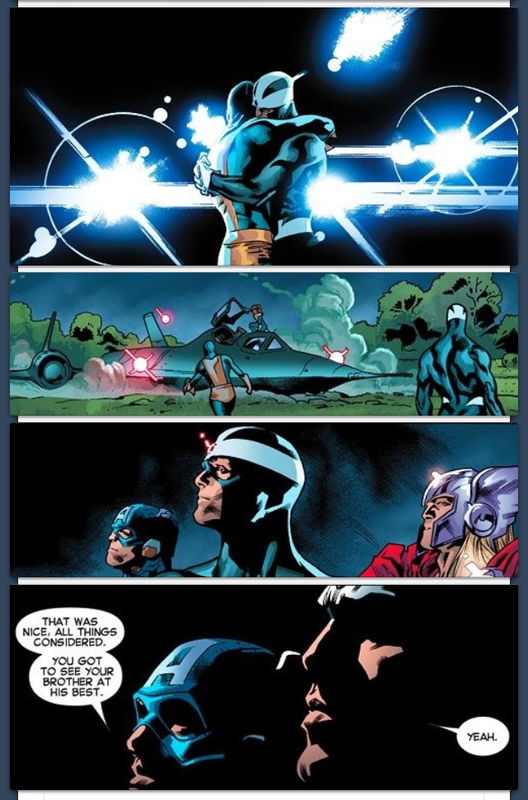 That’s how dad did it and that is how Cyclops does it now. Eva creates a time bubble around the block, it lasts 20 hours. 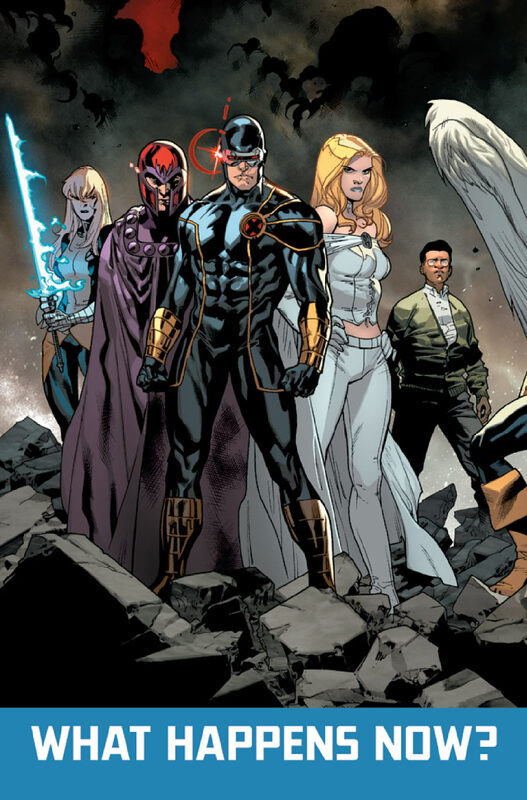 Cyclops, Emma and Magneto show up – I sort of miss these old costumes, even though I saw them for years, it is nice to revisit them. 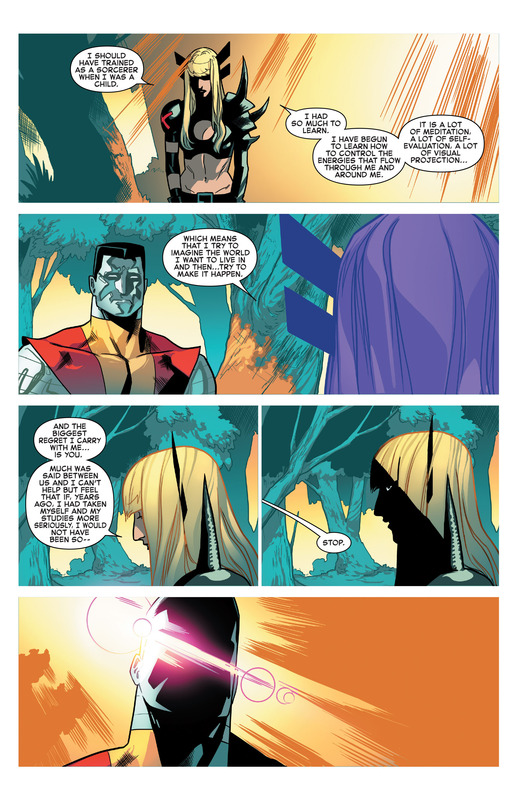 Cyclops calming explains the situation to Eva. Emma finds a way to calm Eva calm and to close the time bubble. Once down, the military and police come rushing at Eva. Totally apeing for the cameras, Cyclops, Emma and Magneto come to Eva’s rescue. Jean Grey School for Higher Learning. Storm, Kitty and Iceman are not happy with the latest news coverage. This is during Kitty’s pink outfit phase. 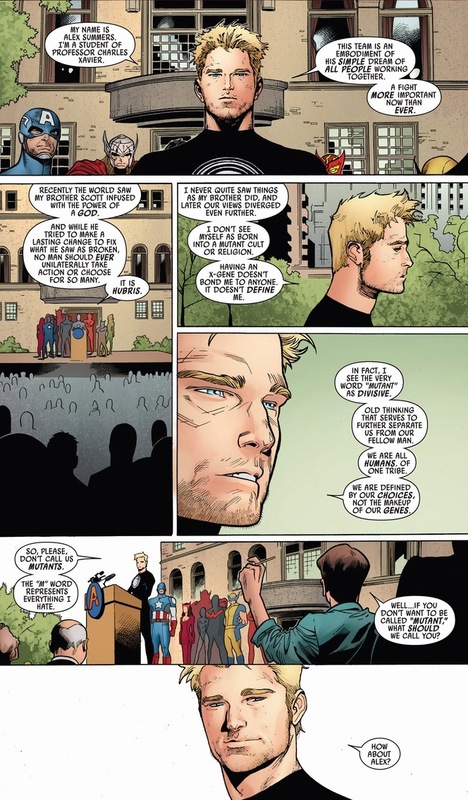 Iceman makes a reference to how young Scott would not be happy with his older self. Ann Arbor, Michigan. Police Station. 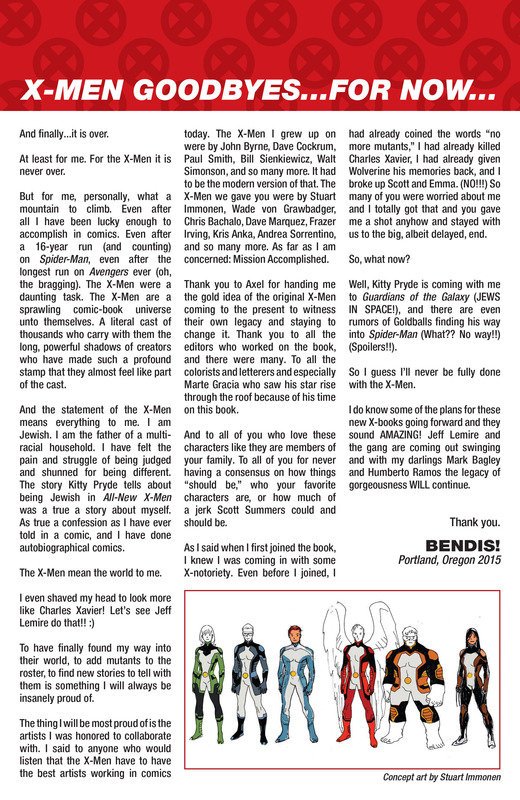 Bendis must like Ann Arbor, as he had Ultimate Spider-Man go there as well. 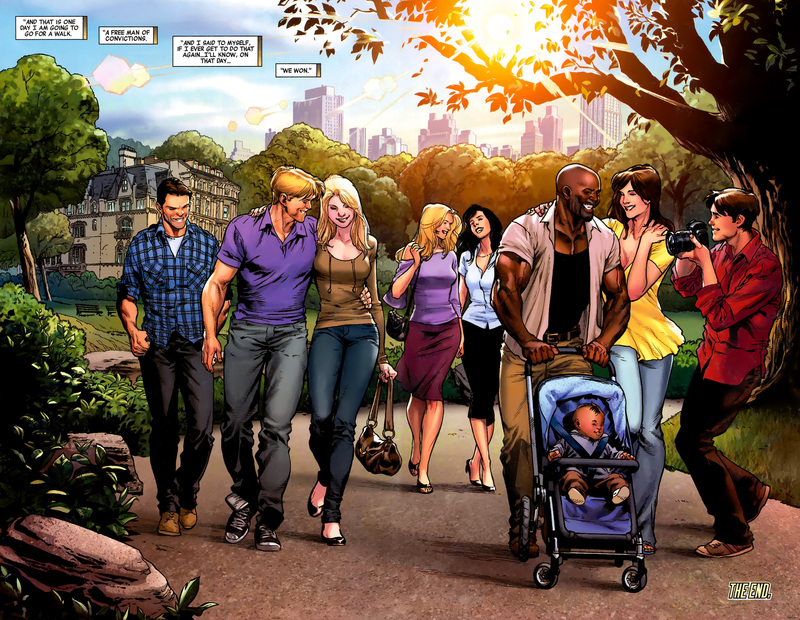 Which was in Ultimate Comics Spider-Man 7, the start of the Crossroads arc. Christopher, later Triage – who is younger and skinnier than he appears on the back cover. Which is the direction you want to go in. He has been arrested for healing his lady friend. Apparently, she was reported dead, and he brought her back. 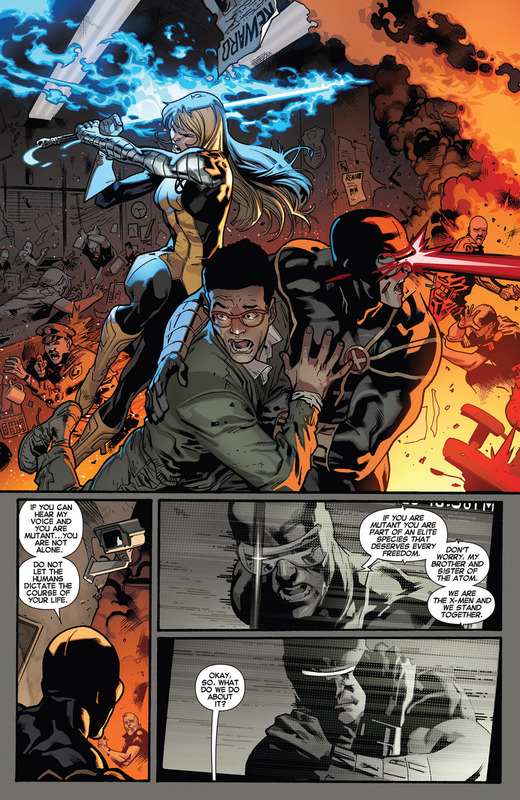 Cyclops and Magik, in her New Mutants uniform, bust Christopher out of the police station. Cyclops finds the camera in the room and makes an announcement. Why they released it to the media, to help him spread his message – is beyond me. Jean Grey School for Higher Learning. 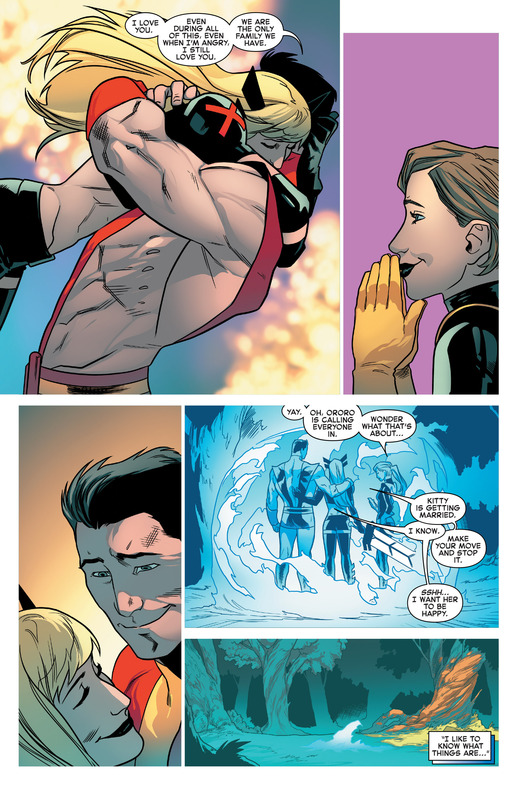 Iceman wants to take Cyclops down. 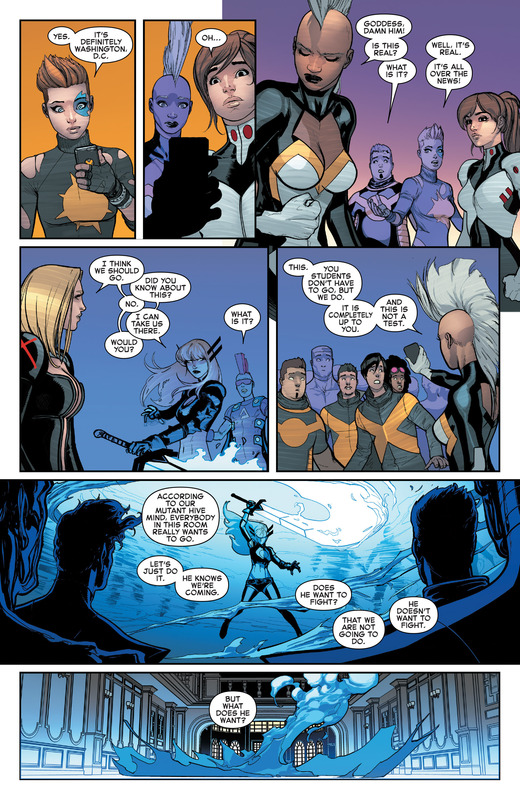 Storm doesn’t has she doesn’t want a Mutant Civil War. Kitty, now in the uniform she has worn for a decade, at least – doesn’t like that Cyclops is going to undo all the hard work her and the X-Men have done over the years. 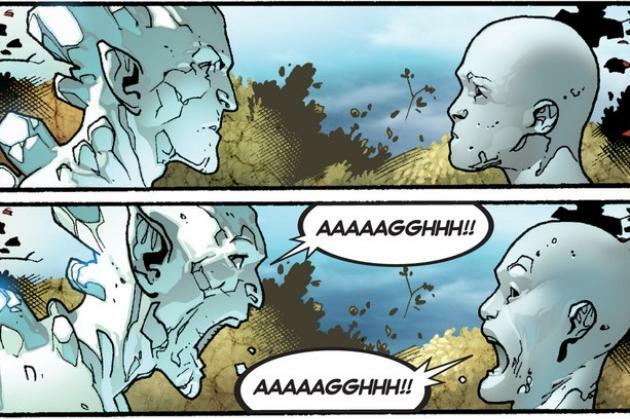 Iceman makes the mistake of repeating his comment about past Scott hating his current self, so Beast hears this and gets a lightbulb over his head. 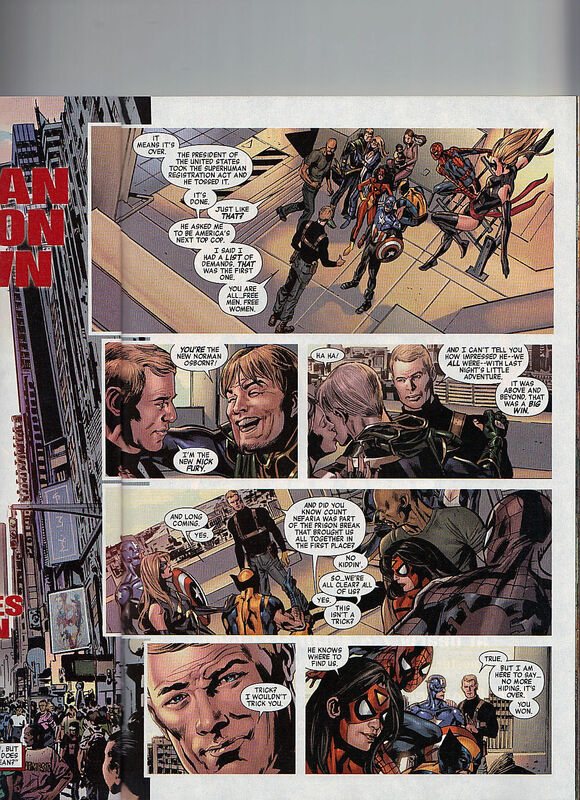 Cut to page five of Uncanny X-Men 8, which came out in November 1964. Scott is writing Jeab a letter, confessing his love to her – which you should never do. Hank is going to quit the team. He is tired of the anti-mutant hysteria. They go out in the hallway where they see present day Beast. Hank recognizes him. Bobby makes a joke about if that is what Hank looks like if he doesn’t shave. Then he makes a great Back to the Future reference – is it our kids? 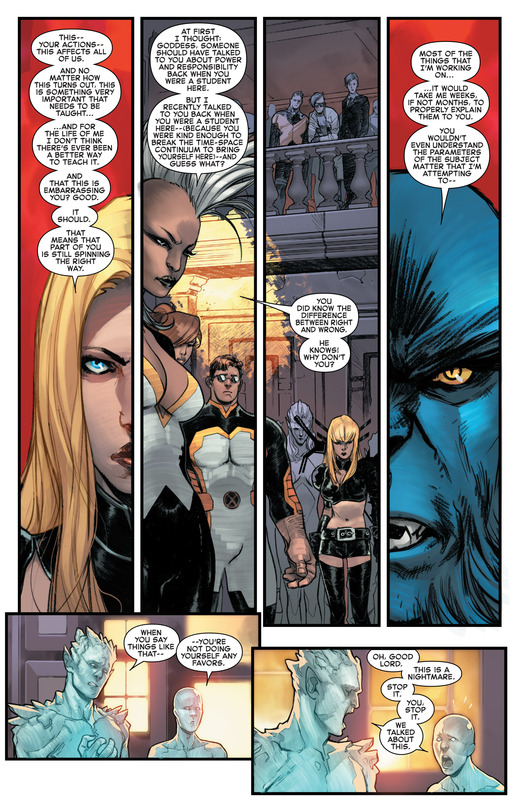 Beast wants to take the Original Five to the present to prevent a mutant genocide caused by Cyclops. This is clearly a lie but he needed to convince them to go quickly, before Xavier mindwiped them all. 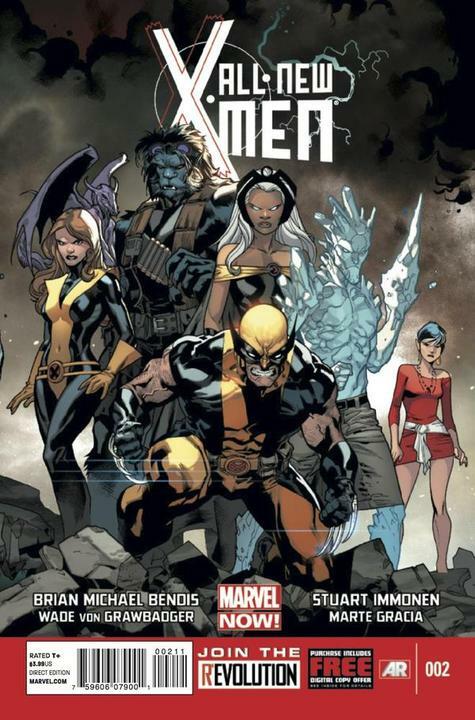 To give a sense of the time frame – Wolverine and the X-Men 20, had just come out. Lockheed only appears on the cover. Eva is wearing the outfit she wore to the club last issue. She also only appears on the cover. The Jean Grey School for Higher Learning. Now. Kitty is outside of Beast’s lab. He isn’t answering her summons, which he isn’t even listening as he is back in time. The very first panel shows Kitty outside of the lab, with no one around. 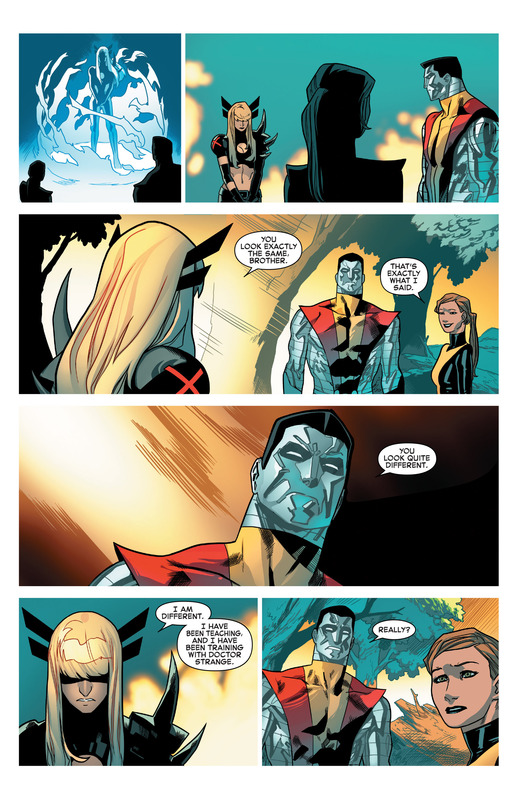 Three panels later, Iceman is right next to her. Where did he come from? Kitty enters the lab and looks around. She is confused by some of the readouts that are displayed. Iceman knows she is a genius so this is way out of his league. I like how Beast uses his classic 80s Beast ape man face as the warning screen. Then. 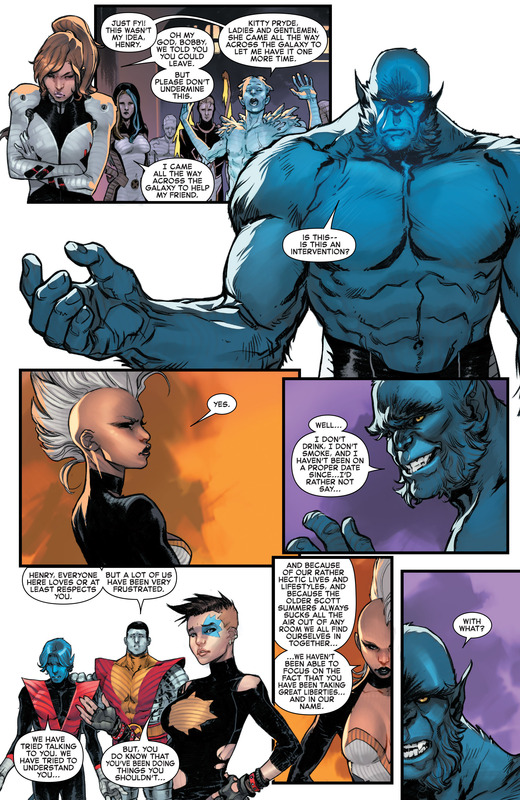 Beast is trying to convince the Original X-Men to come with him. Bobby can’t believe that the guy he knows, Scott, can be responsible for any deaths or destruction. 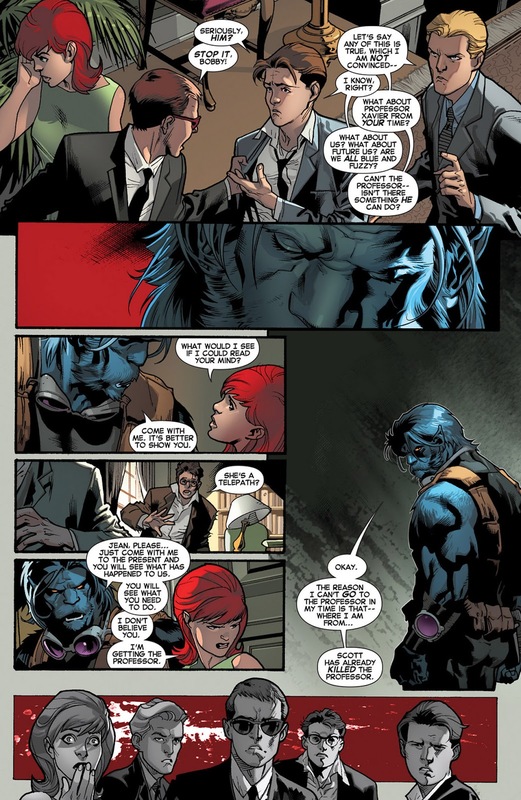 Beast asks Jean to read his mind, so that she knows he is telling the truth. This is shocking to her, as she didn’t know she could read minds. She was just a basic telekinesis type at this point. Warren starts asking why Beast can’t talk to his time era Xavier. 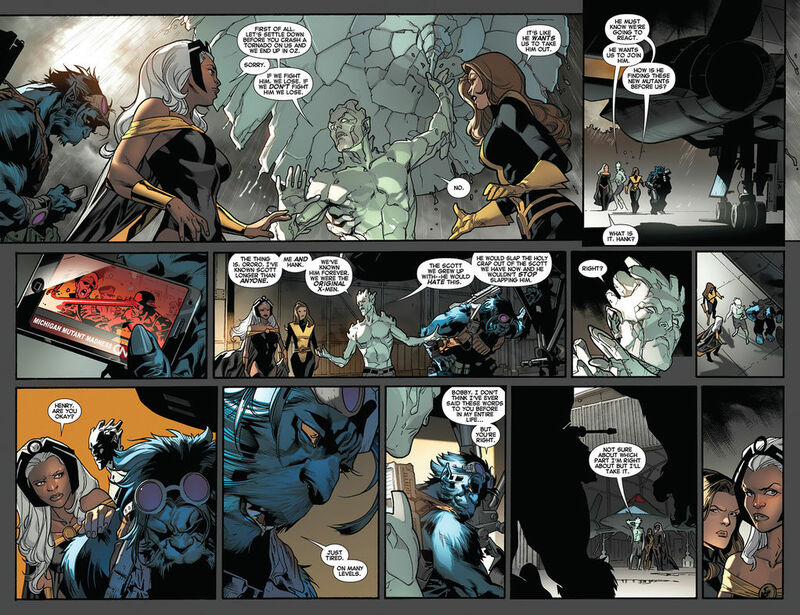 Beast takes a beat and then tells them that Cyclops killed Xavier. I really like the panel where they hear this with the broken glass effect before their heads. Scott is just shock by all of this news. Beast talks to his younger self, trying to convince him of the stakes involved. He even swears on their mother, which poor Hank doesn’t even know that an alternate timeline version of himself will later masquerade as him and kill his entire living family. I would leave that out too, if it was me. 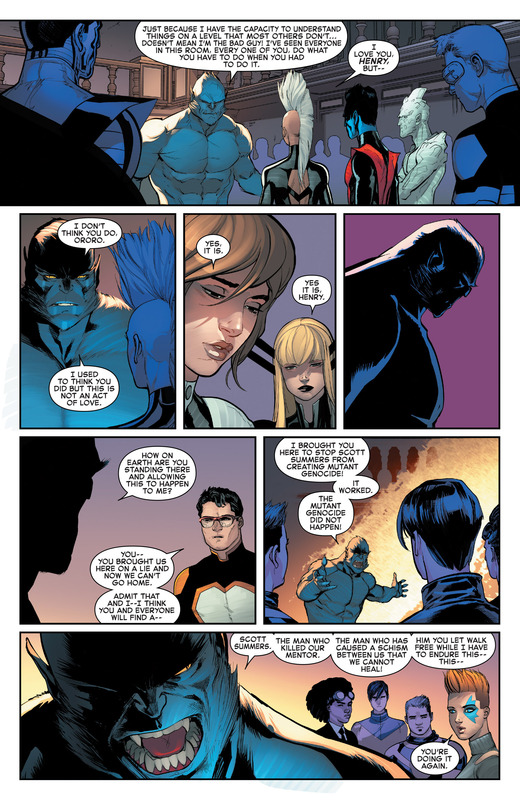 Warren wants to know why Beast doesn’t just kill Cyclops, as he killed Xavier. Beast tells him that he refuses to take anymore lives. Beast goes outside and has another attack. The Original Five are in costume now and agree to go to the present, just to investigate the claims. Once there, they are amazed by the size and appearance of the school. Jean wants to know why the school is named after her now. 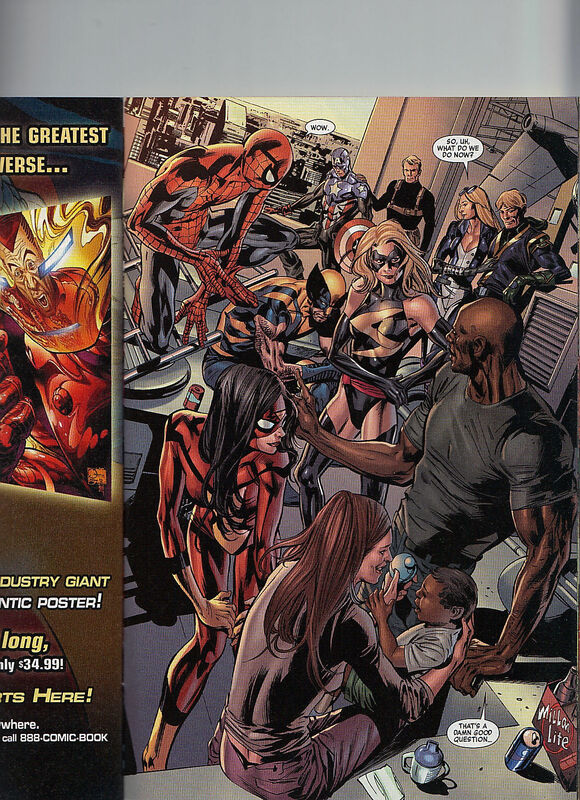 There is a double page house ad for Amazing Spider-Man 700. Don’t worry, Spider-Man comes back it takes a year and a half, but still. Wolverine is teaching a class about what to do when fighting a ninja master. He then gets a whiff of a scent and leaves the room. 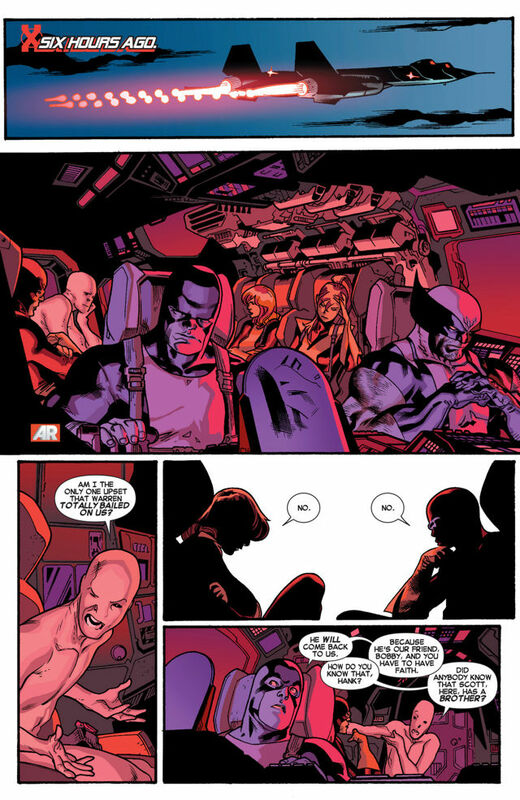 Wolverine jumps at the Original Five X-Men, and Jean holds him in the sky and Scott optic blasts him. Bobby freezes him. 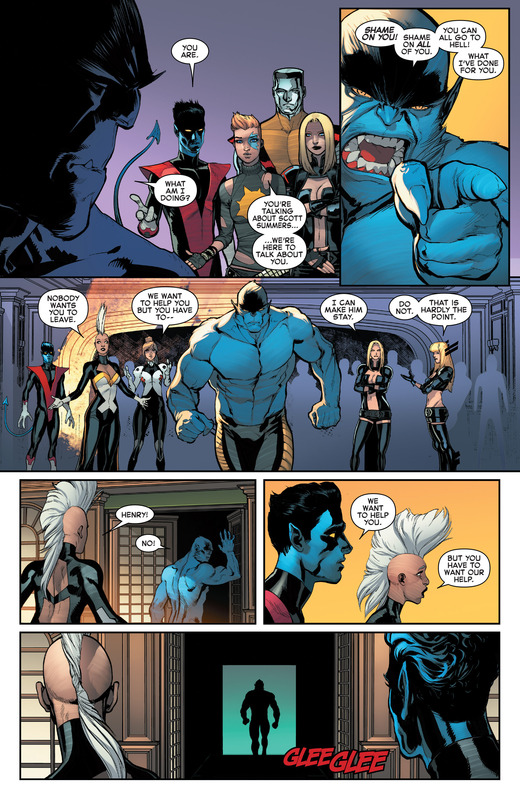 Storm, Kitty and Iceman all come out and are not pleased with what they see. Pretty fun. 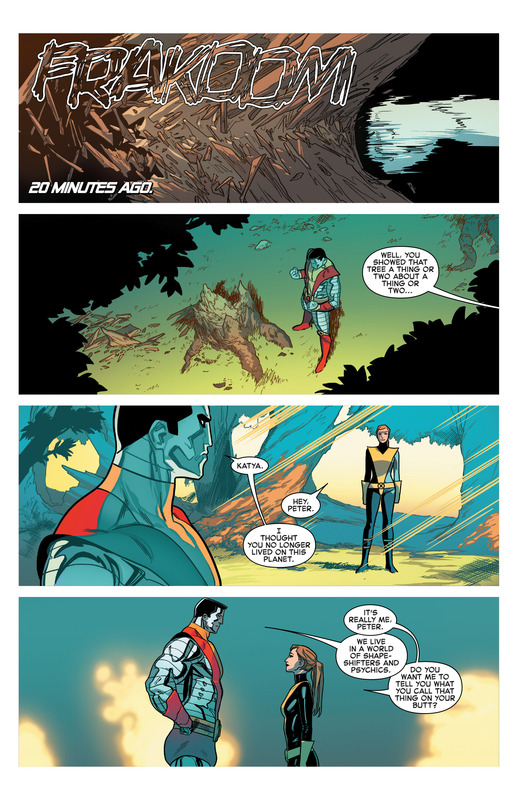 Bendis knows, even at the start, to limit Bobby to just two great moments per issue. Beast has another attack, this one freaks out Hank. Kitty is the only one, besides Hank, who knows her way around the lab. 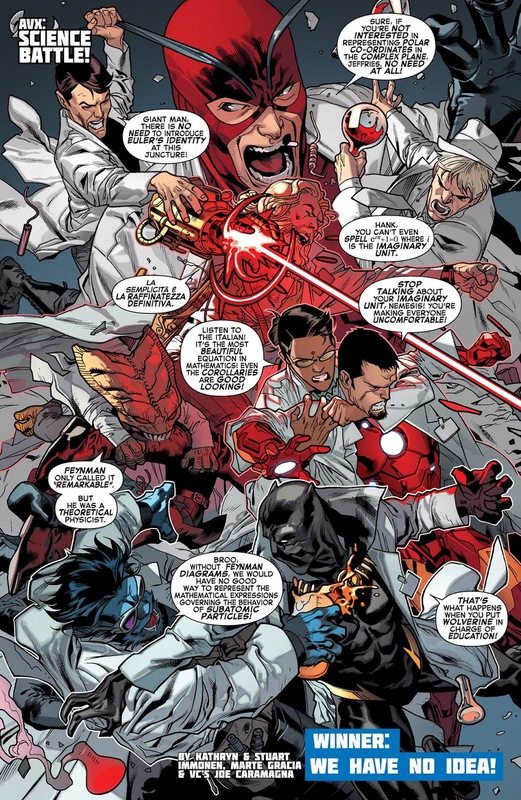 Storm tells them that Reed Richards and Tony Stark have messages for them to respond quickly. She mentions Horizon Labs, which I’m not familiar with. It is the place that Peter Parker works at that where Doctor Octopus once he is ‘Peter Parker’ excels at. 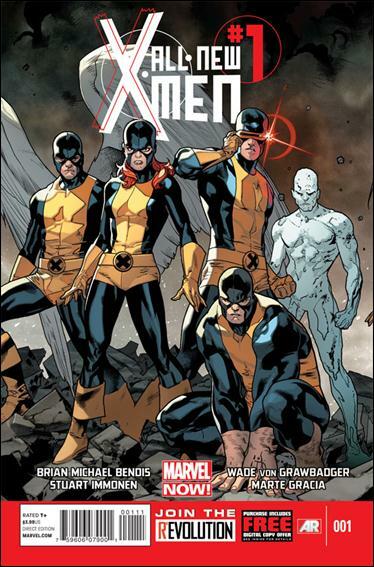 Iceman looks at the Original X-Men, wanting to know what they were told. Scott says that he is there to speak to his older self. Something that even in the present day, hasn’t really happened outside of a few lines. 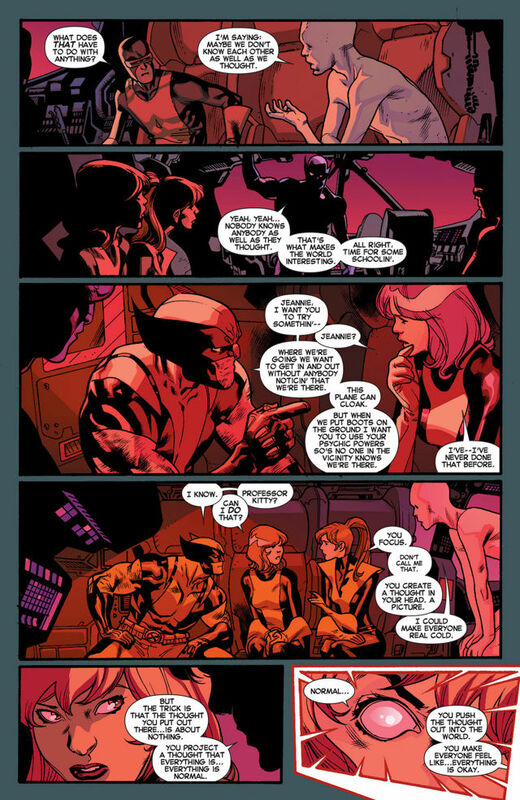 Jean reveals that Wolverine’s thoughts are that he wants to send them back immediately but also that Beast is his new hero. Scott still can’t believe he killed his mentor. They see Cyclops on the news. Bobby can’t believe televisions are not better in the future. She also reveals that Wolverine runs the school. Bobby can’t believe a guy like that, with claws, will run a school. Hank knows that his present day self is dying. That’s why he risked time itself to bring them forward. Scott wants to really meet himself and have a nice chat. 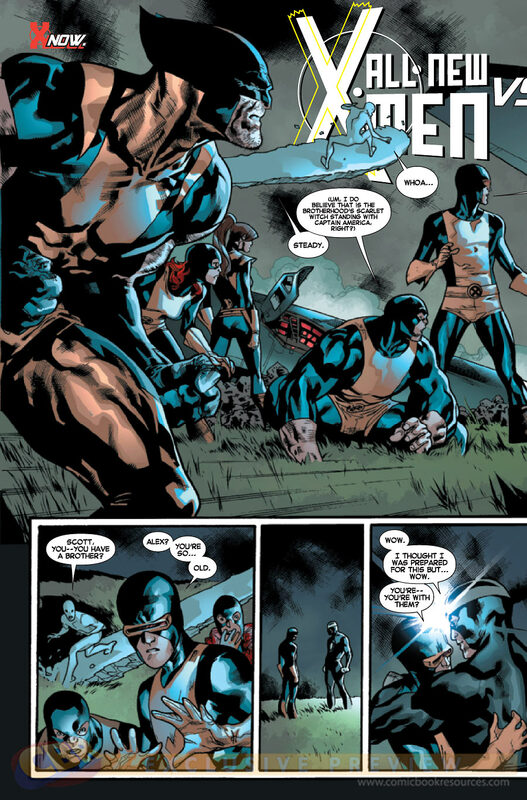 Bobby knows that Cyclops is seeking new mutants, so maybe they should. Just then a news reporter states a new mutant has been found at the University of Dallas, so they take the Blackbird and away they go. Kitty enters the room and sees only Wolverine sleeping away. 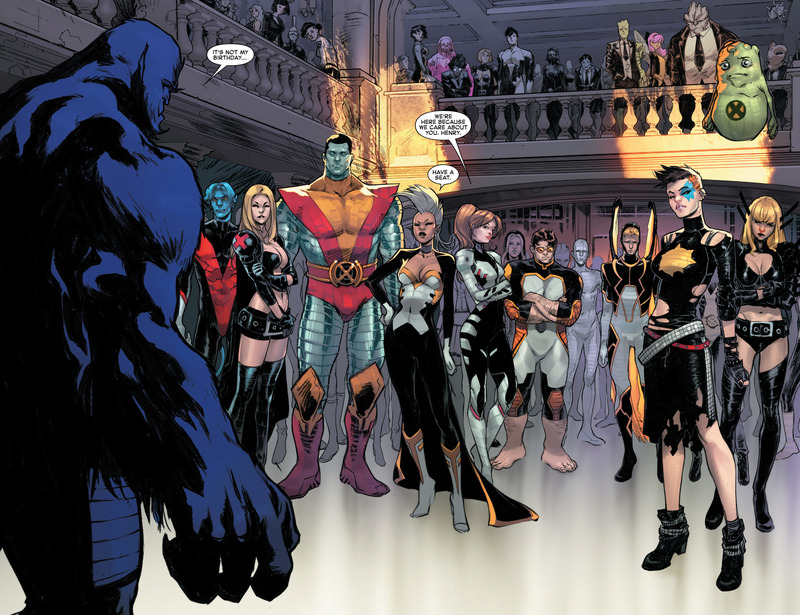 Issue ends with the X-Men watching the Blackbird fly away. He can’t believe Jeannie is around again. 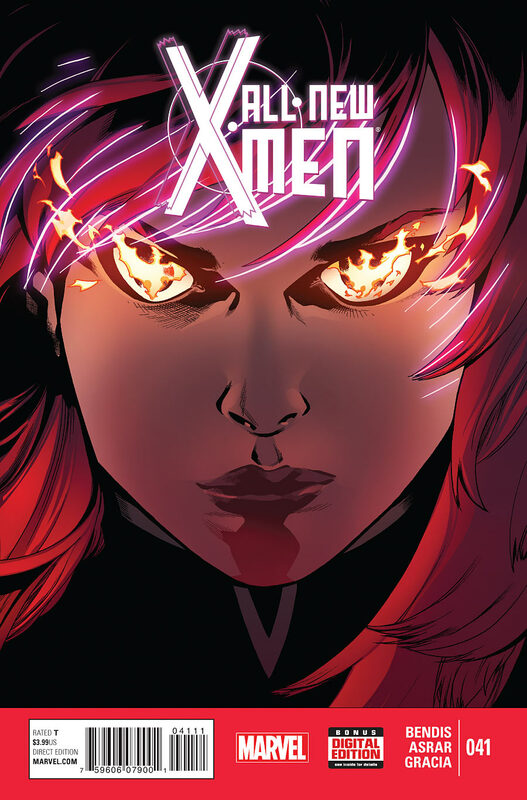 Not sure when I will review the third issue but it has been great to go back to these early issues of All New X-Men. 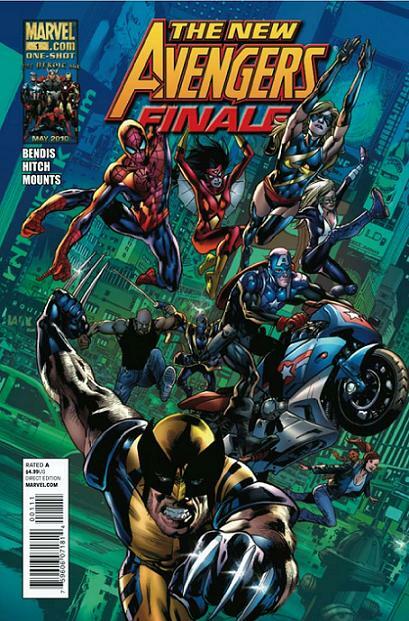 By the time this issue came out, AvX was over so this miniseries had a chance to just have fun with itself. 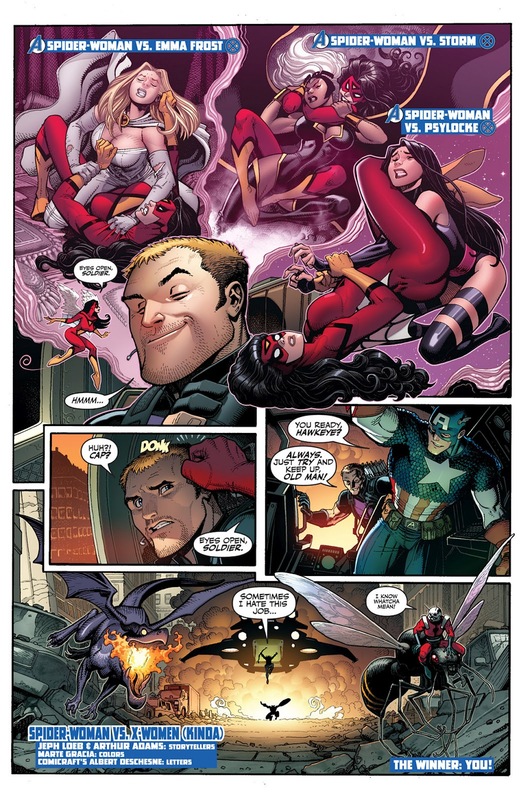 I own it for the very funny – Spider-Woman vs X-Women (Kinda) via Hawkeye’s imagination. Because he was dating her at the time. I own the overall issue because of Lockheed on the bottom right corner there. Who knows why he was included, but I’m glad he was. The winner is us, because of the Lockheed appearance! 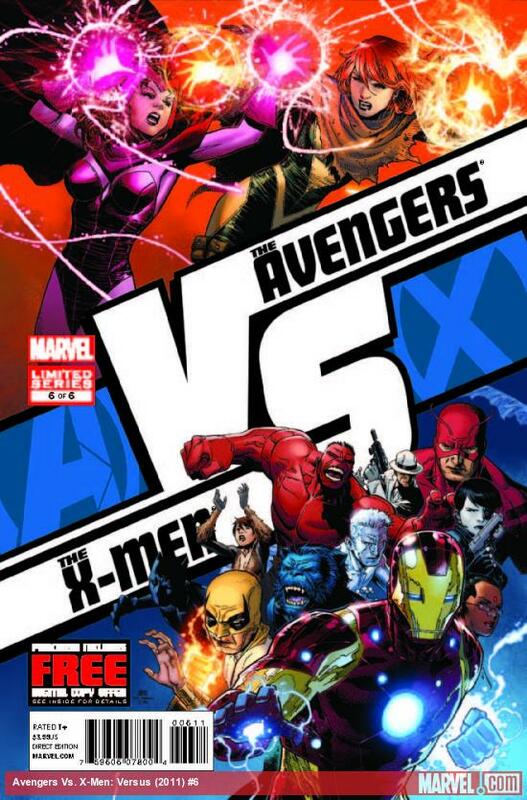 AvX : Science Battle, which I’m including due to us celebrating Ant-Man Month! Yesterday, we passed our Total Views of our Home Page / Archives, from last year! So now all of you great visitors are just adding to making next year’s goal harder to hit! But seriously, thanks to you all for coming to this blog and making it a continued success! I really appreciate it! Just the other day, I was feeling pretty good with typing away a review post and realizing how much I enjoy doing it. I really should have started this blog months earlier but I’m glad that I have this creative outlook now. It is a happy happenstance (happistance?) that I got to review these posts back to back. 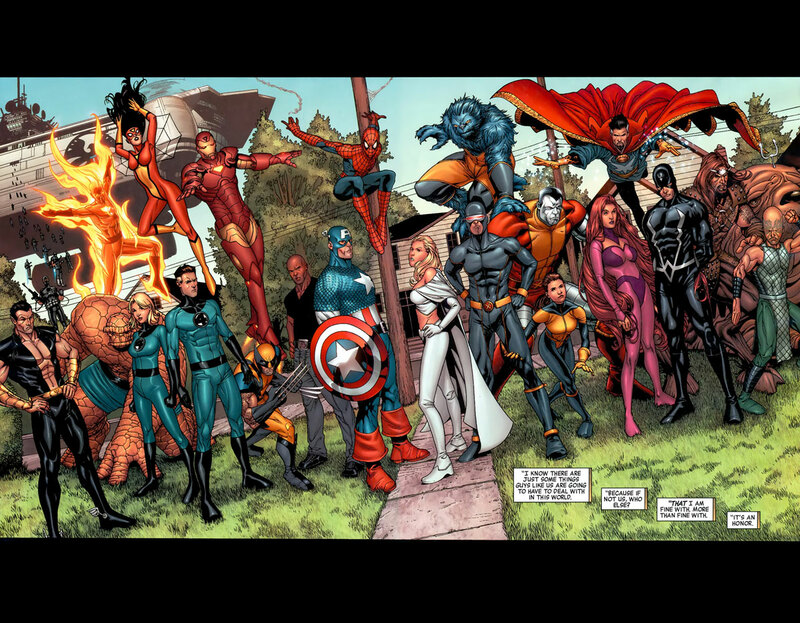 Avengers Mansion. Hours ago. Havok is watching his older brother make an awesome speech on the news. Captain America comes into the room, there is a problem with his brother. Havok wants to know what Scott has done now. 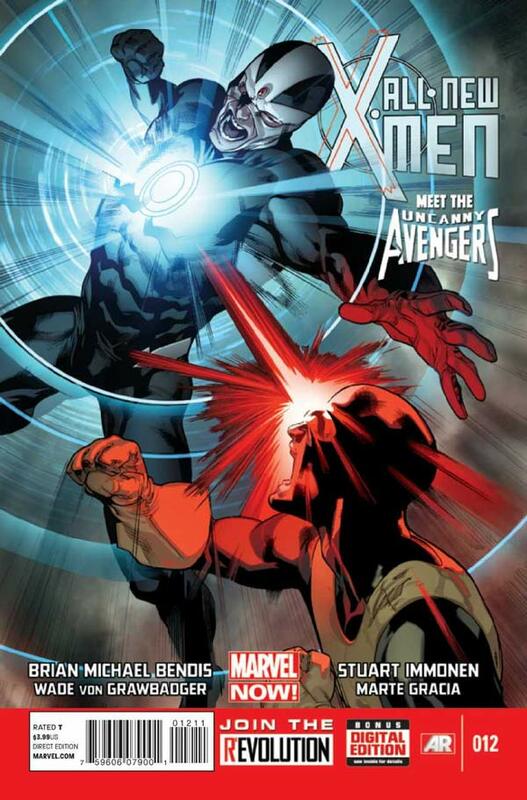 The All New X-Men vs Uncanny Avengers! 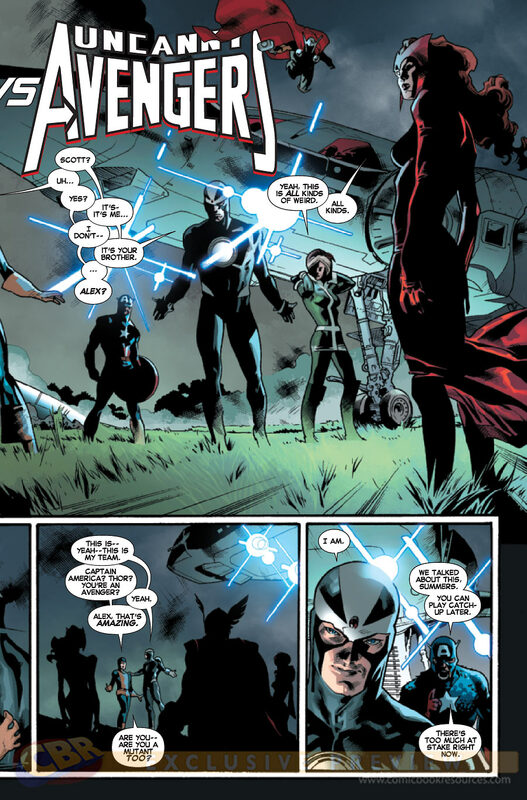 The Uncanny Avengers are – Havok, Captain America, Thor, Rogue and the Scarlet Witch. 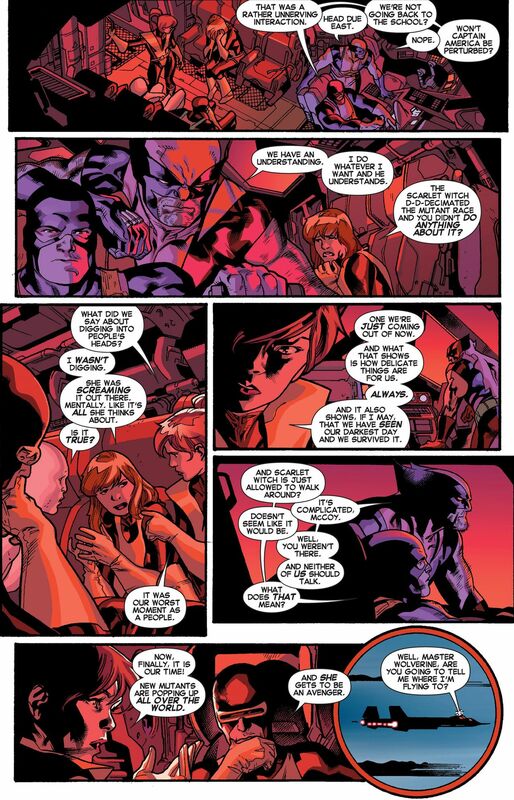 The All New X-Men were pulled from Uncanny X-Men 8, so when Beast states that Scarlet Witch is from the Brotherhood of Evil Mutants, that is all he knows her from. 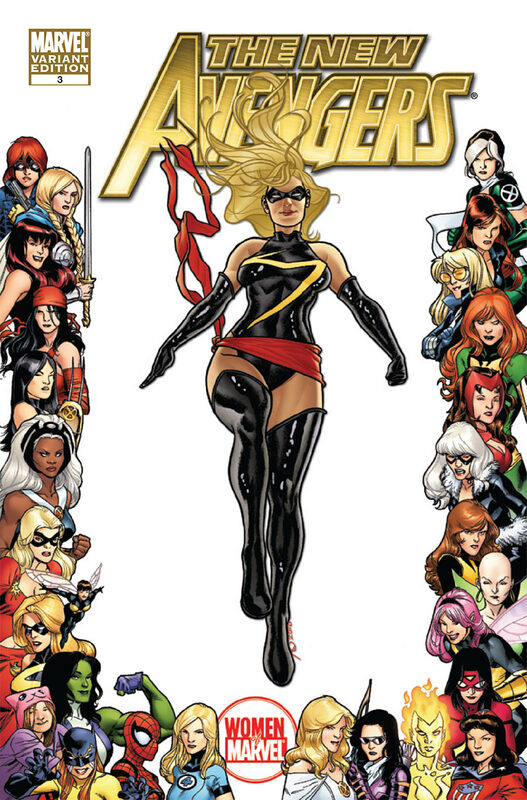 At this point, she appeared in issues four, five, six and seven, so the team knows her pretty well as a villain. She would show up again in issue eleven but they will never know that. Beast didn’t know Scott even had a brother. Scott hasn’t even thought of his brother in years. 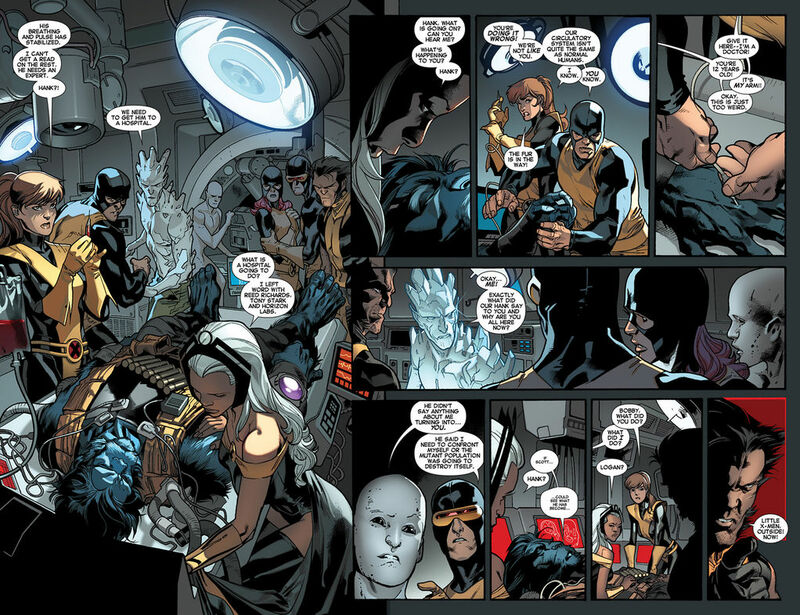 Scott wouldn’t see Havok in the proper continuity until issue 54 of Uncanny X-Men. The two brothers hug. Scott is so impressed that his brother is a member of the Avengers. Not just a member but leading a team with Captain America and Thor as members. That is pretty impressive! Scott and Havok go and have themselves a chat. 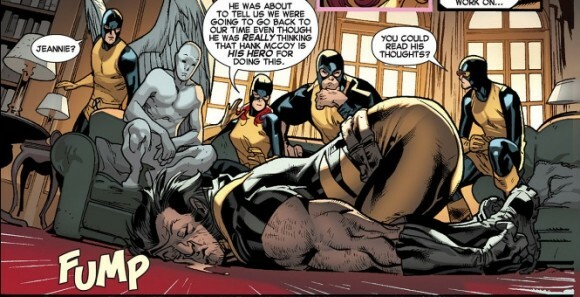 Havok explains that he was an X-Man at some point. 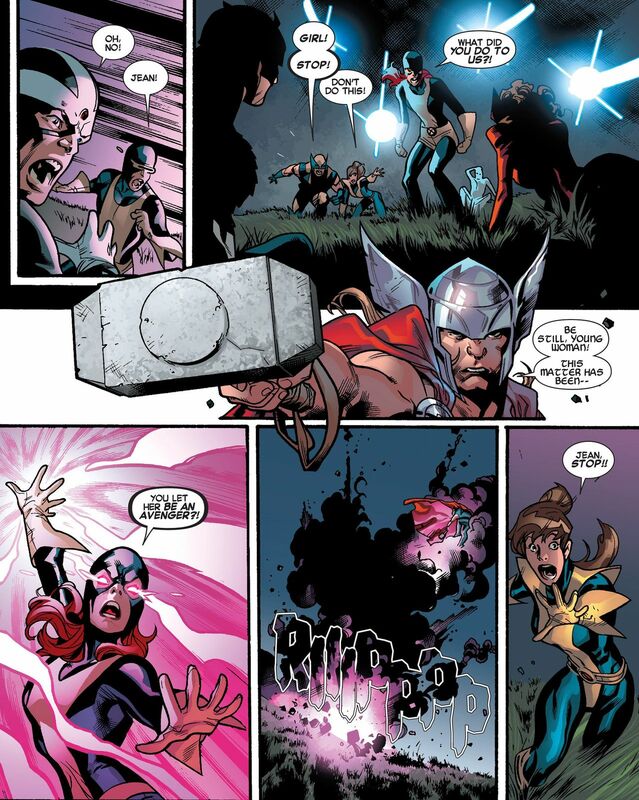 Scarlet Witch and Thor know what it is like to have a brother, so they want Havok to have this moment. Havok has to tell his young older brother that they haven’t been closed in a while. 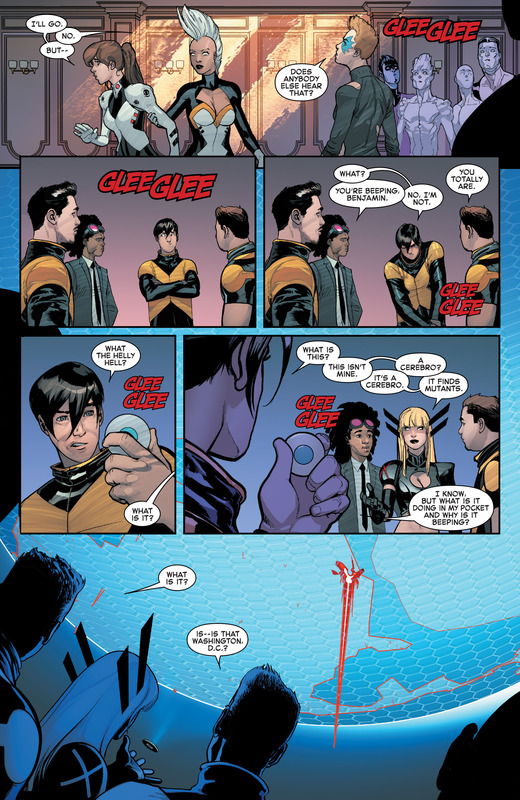 Scott tries to play it off like his older self didn’t kill Xavier but Havok states that that is exactly what happened. 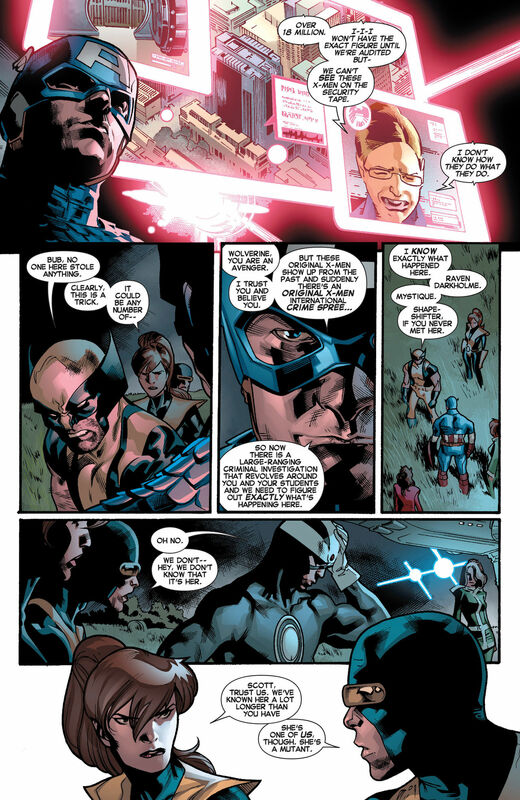 Havok tells Scott that the Original Five have to go back in time. 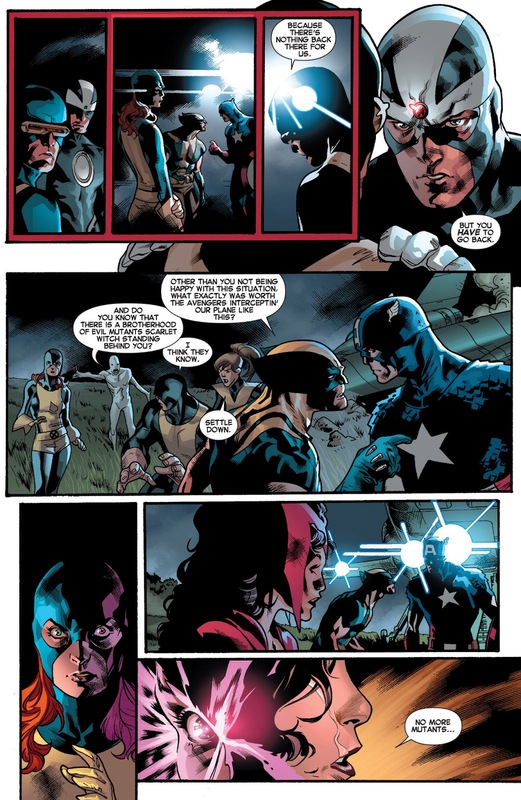 Wolverine confronts Captain America. 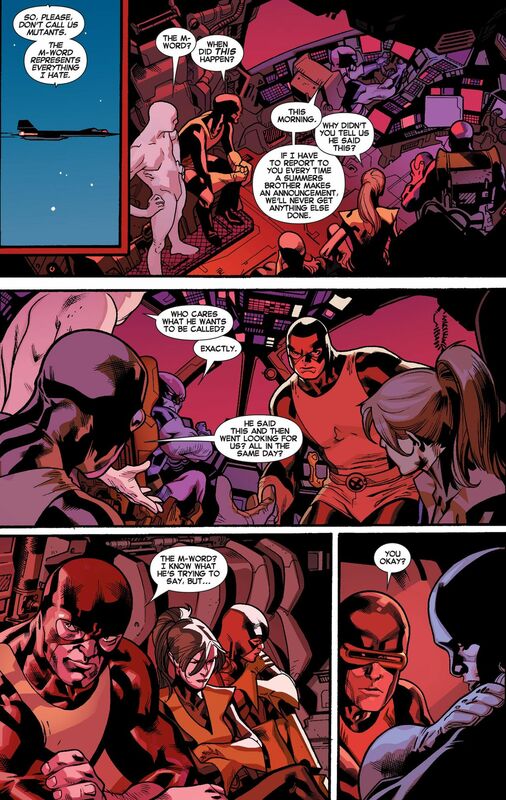 Kitty wants Bobby and Hank to calm down about the Scarlet Witch. Jean, because she is a psychic brat, she reads Wanda’s mind and sees the image of the sentence fragment that ruined mutants everywhere. 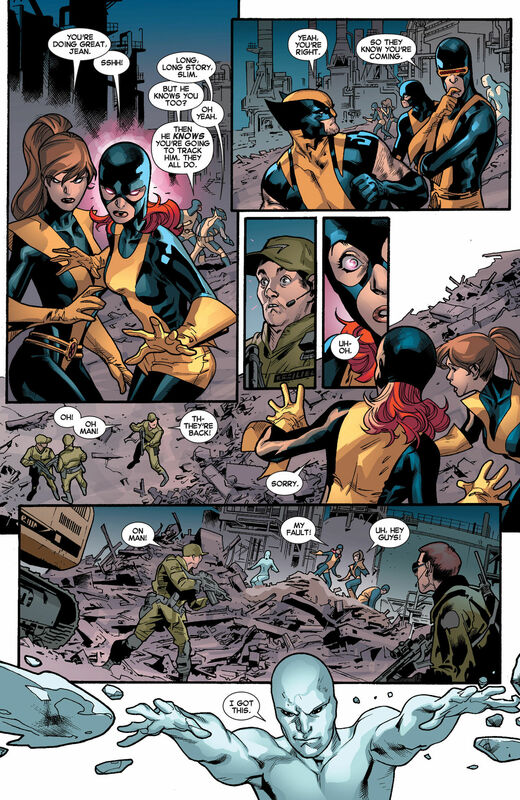 Jean knows that Wanda is a murderer. Jean just loses her mind. Wanda is mostly upset that her privacy was invaded. Jean then hits every body with a telekinesis wave. Kitty wants Jean to calm down. 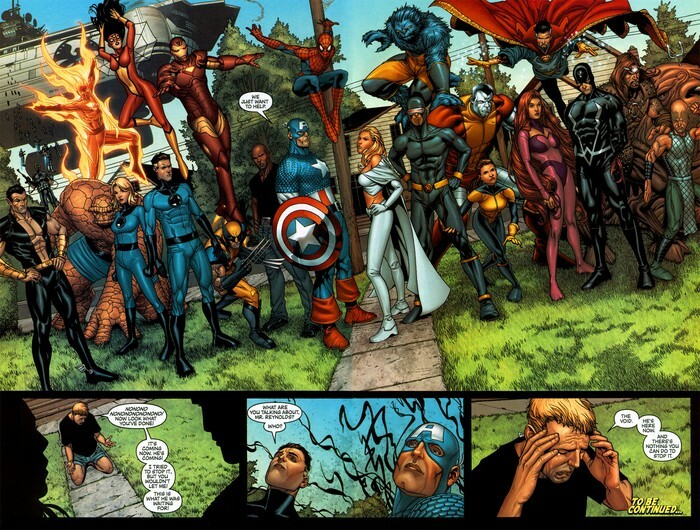 Jean can’t believe they let Wanda stay as an Avenger, which is pretty amazing. Wanda casts a spell. Jean is now in quicksand. Rogue can’t believe there is a yet another out of control Jean in the world. 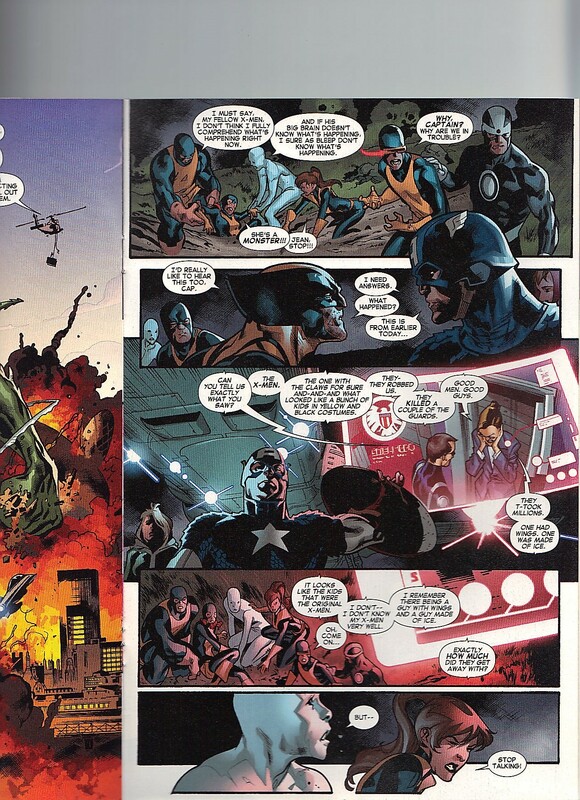 Captain America wants Jean to calm down. Jean now has the notice that mutants were in the millions and then they were under 200. The Bank of England, London. 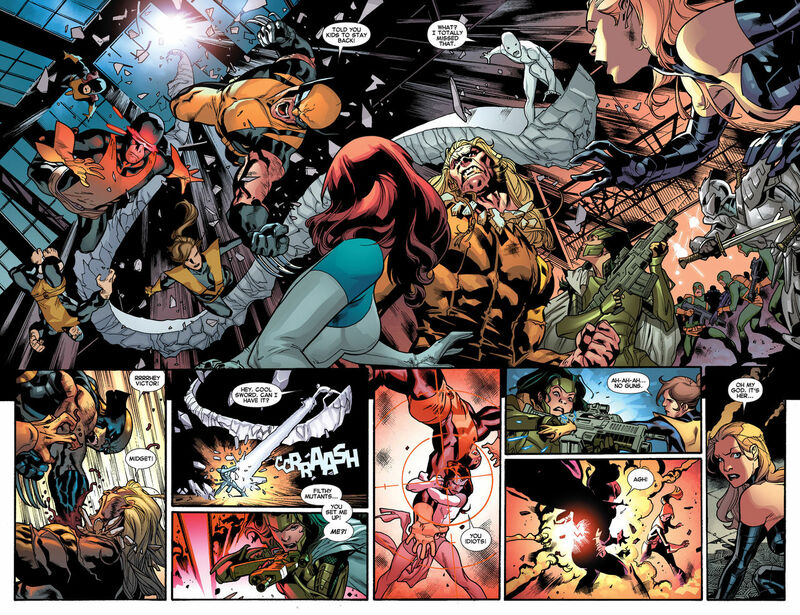 Sabretooth and Lady Mastermind are causing all sorts of destruction. Lady Mastermind is wondering why they are stealing all of this money, they have enough to buy a small country. 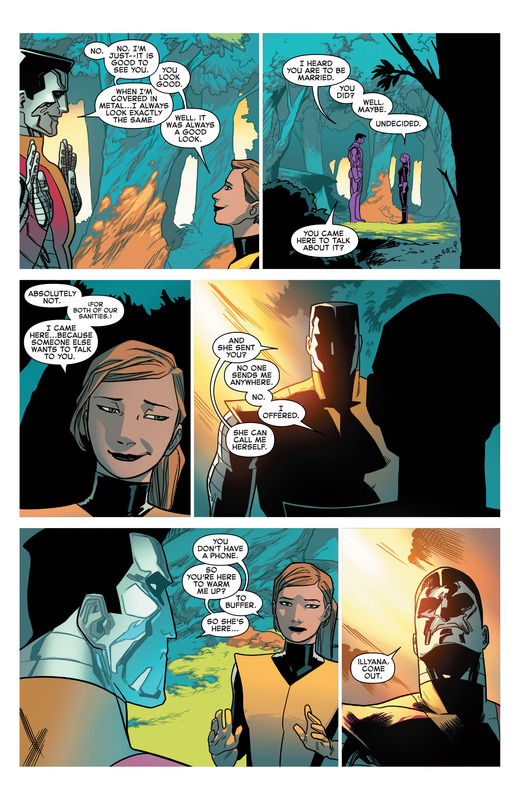 Lady Mastermind talks to Mystique about she actually cares about Xavier being dead. 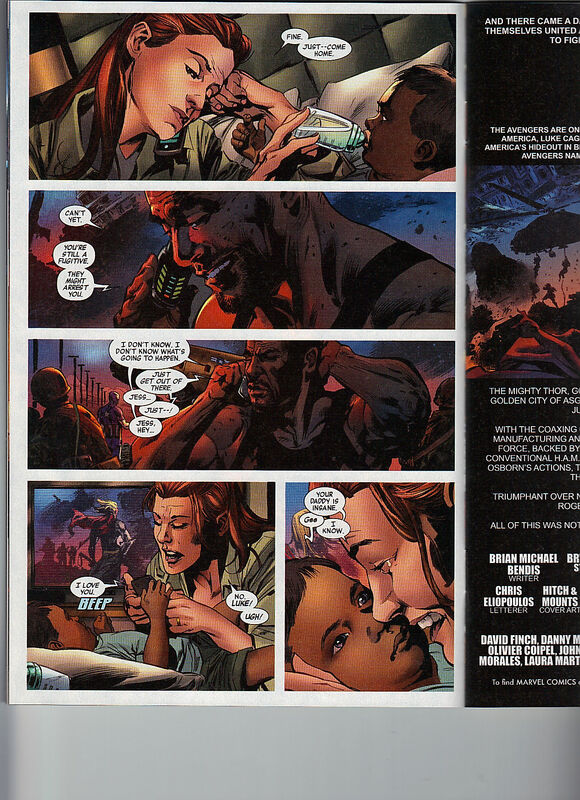 Look at Bendis setting up six years ago that Mystique loves Xavier! 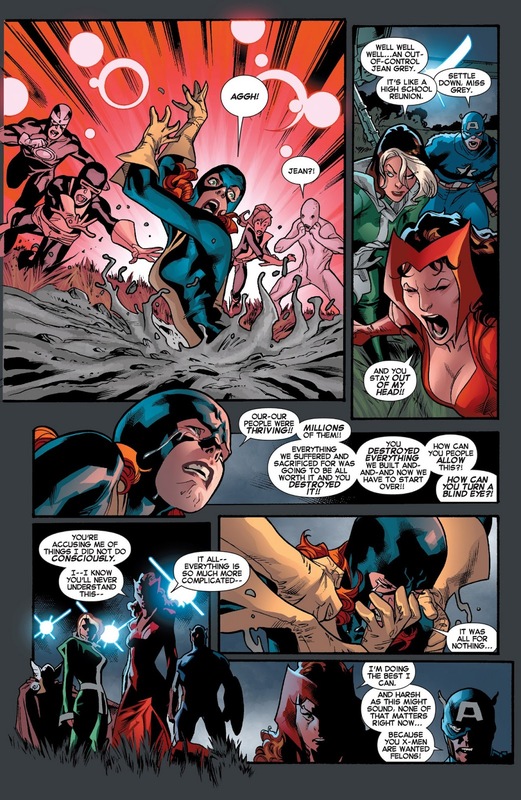 Even while Jean is stuck in the ground, she is gong on and on about Wanda being a monster. Cyclops wants to know why they are in trouble. Wolverine wonders too. Captain America shows some footage about how the Original X-Men are robbing all types of banks. I like the lady revealing how much she doesn’t know her X-Men facts. I imagine they don’t get much news footage. Kitty wants Bobby to shut up. He’s not doing very well in this issue. Wolverine reveals that it couldn’t be the Original Five X-Men. It must be a shape shifter like Mystique. 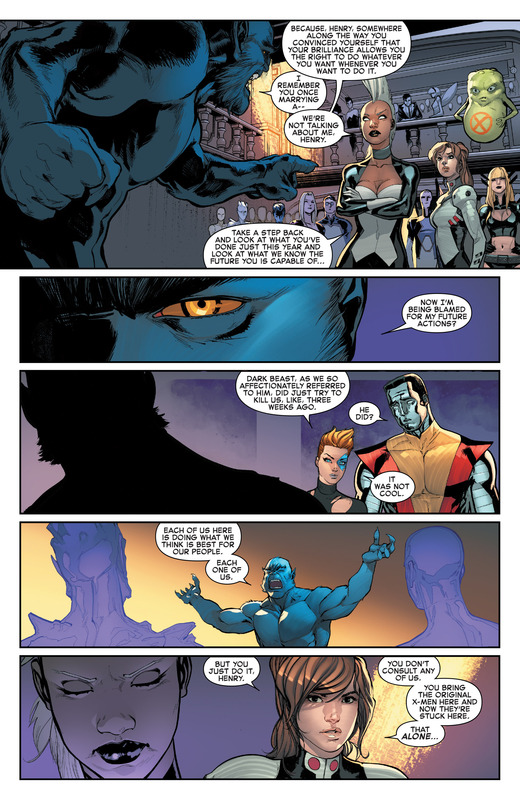 Scott defends Mystique, makes sense that a 17 year old would be into Mystique – lots of possibilities. Kitty tells Scott that he doesn’t know the real Mystique. 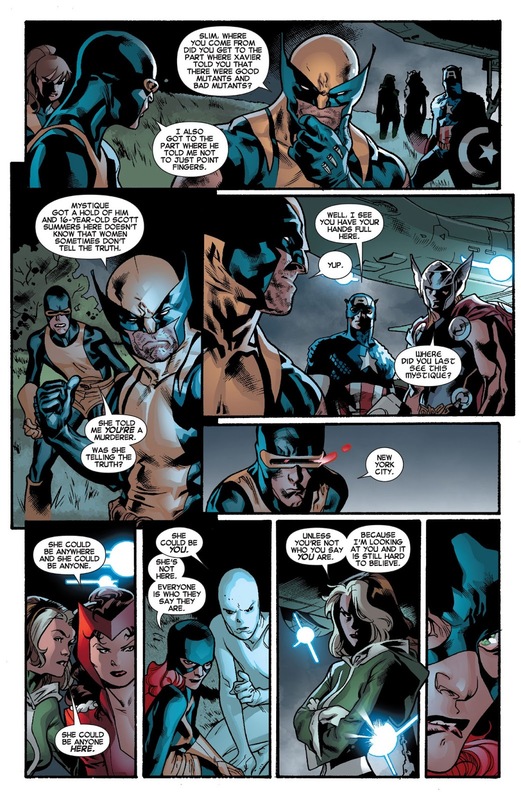 Wolverine keeps calling Scott, Slim, it seems weird. 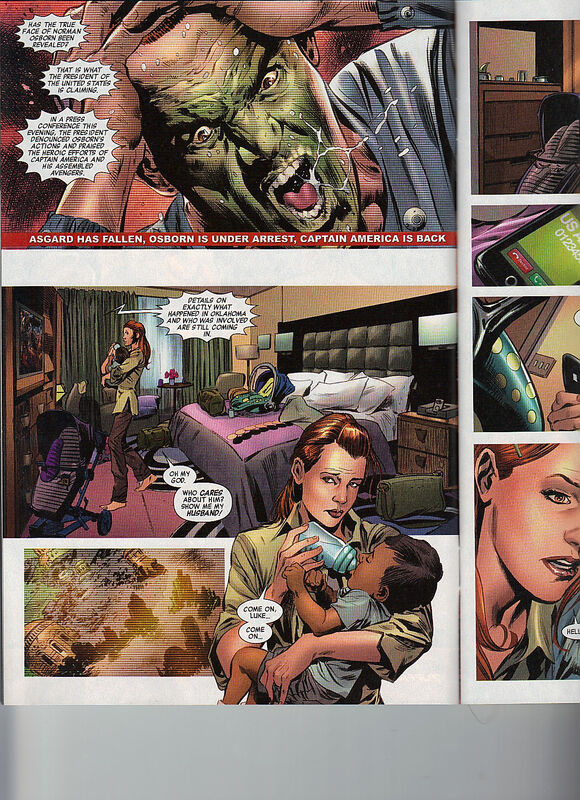 Also weird is Rogue having asides with Wanda, are they friends? Rogue says that Mystique could be Jean but she used her powers earlier, so it couldn’t be her. Captain America wants Kitty and Wolverine to take the students back to the school. Kitty tells him that they can take care of themselves. Good for her! Scott is all about this being a mutant problem so there should be a mutant solution. 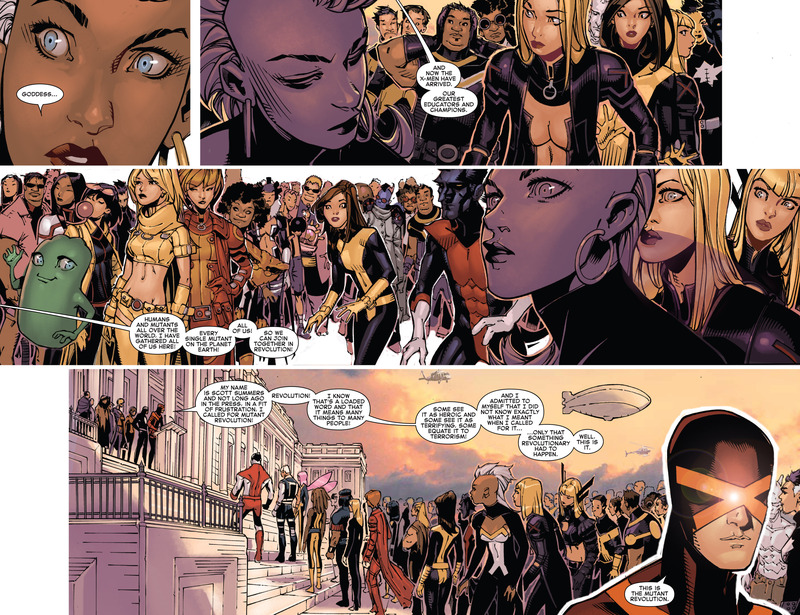 Rogue and Wanda explain that there is no more mutant and human problems, just people problems. A Summers Hug! Who even knows when that happened last time. I thought they high fived but that must be another issue. Kitty explains to Jean that M-Day was a horrible day and that the mutant community is just now coming out of it. 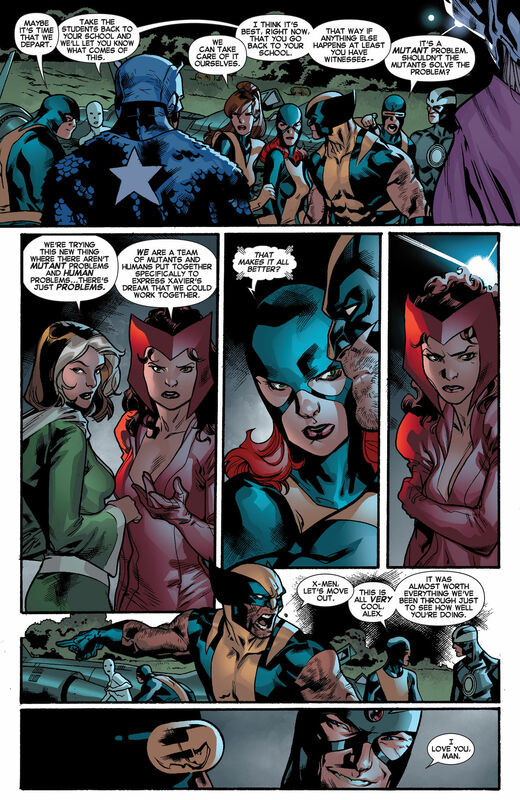 Wolverine is not taking Cap’s advice and is going to still pursue Mystique. 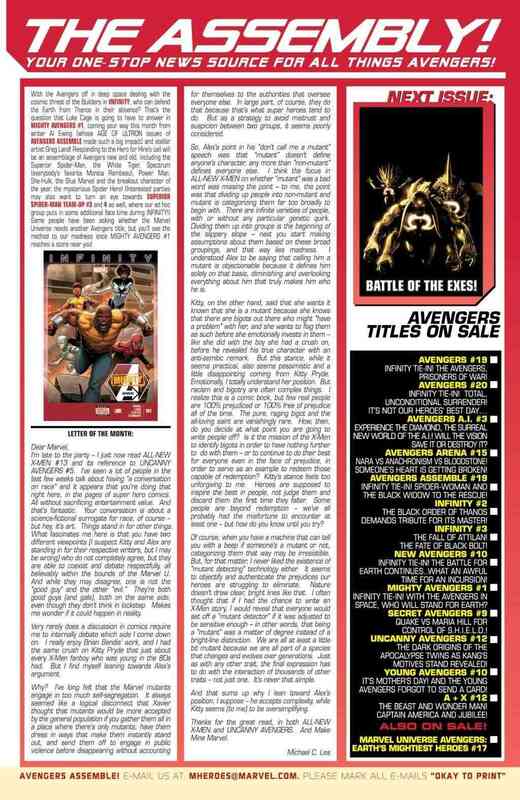 There is an ad for Age of Ultron 10. 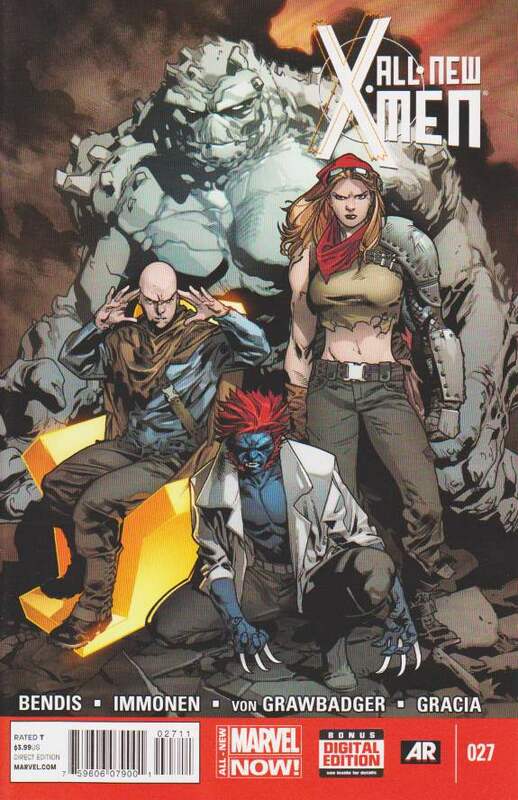 Issue ends with Mystique, Sabretooth and Lady Mastermind surrounded by all of their sweet stolen cash.